Instagram now has over 1 billion monthly active users and has the highest per-post engagement rates than any other social platform. This means it is the place to be for people and businesses. What better way to start off 2019 than putting my knowledge of Instagram to the test? In this blog post, I’ll be sharing my experience of starting a new Instagram account. 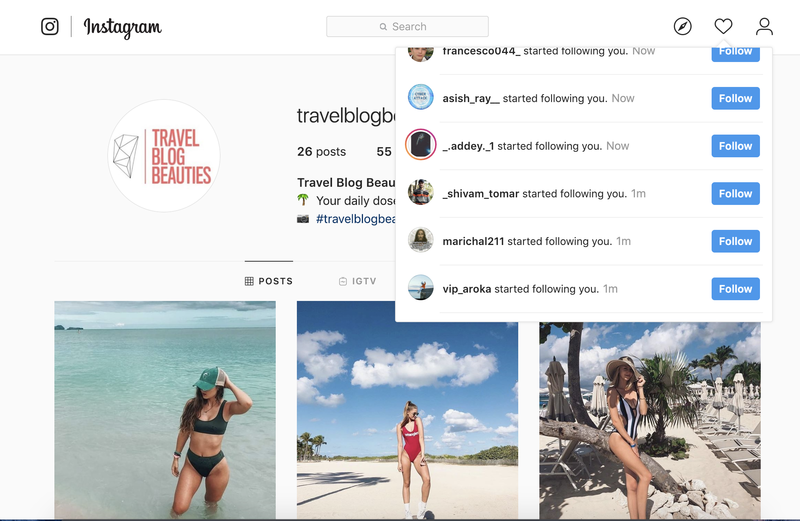 On 14th January 2019 at 4:30pm I created the account @travelblogbeauties to repost peoples travel pictures from around the world. From starting the account up until now I was re-posting 3-4 images per day that all had a similar theme, subject and filter. On 22nd January 2019 tried to boost followers and grow the account by using a common service - buying followers. I visited a site called skweezer.net that can give you 50 followers for free using their trial. All you had to do was enter your Instagram username and email address. Within minutes of signing up my account was being bombarded with new followers. 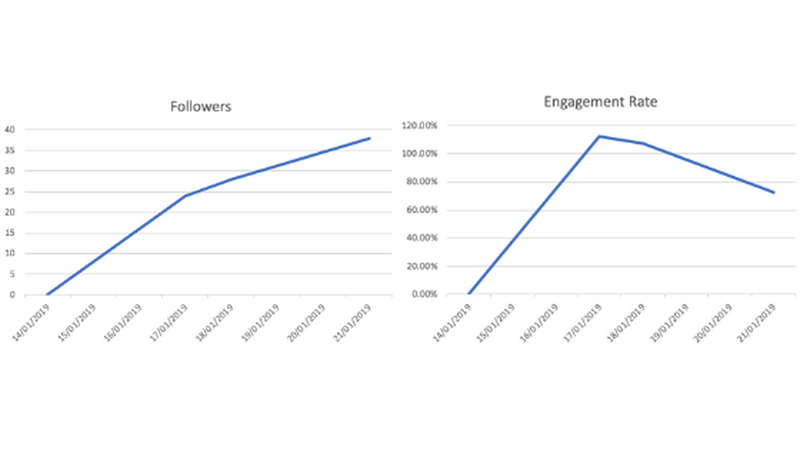 After continuing to post regularly my engagement rates began to rise again as the amount of 'fake' followers started decreasing. The common misconception with Instagram is more followers = more successful - this IS NOT the case and I can't stress it enough! In Instagram Insights (available once you've reached 100 followers) you can see where your followers' demographics, age, gender and most active times/days spent on the app. Use this information to calculate when is the best time to post. I see followers is a vanity metric. 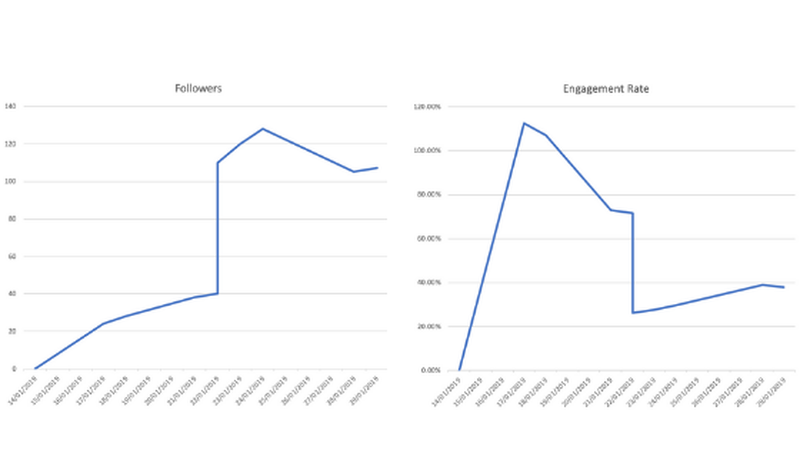 The thing you want to track is engagement and impressions - this shows how engaged your followers are with your content. Ultimately the higher your engagement is, the more likely people are going to interact with/buy from your brand. What would you rather have: 10,000 followers who aren't very interested in your brand but just follow you or 1,000 followers who love your brand and regularly interact with your content? I know which I'd rather have. This means don’t buy fake followers as the majority of the accounts that follow you will be bots and won't interact with your account. 72% of Instagram users saying they have purchased a product they've seen on Instagram attracting the right audience has never been so important.